I am surrounded by the repeating sound of a TV cartoon song named “64 Zoo Lane.” My three-year-old daughter has been singing this song non-stop for about twenty minutes. “Welcome to my World.” I am not referring to the assessment tool which early intervention practitioners use as an open window into a family’s daily routines, but welcome to my world, from the perspective of an individual who has encountered the beauty of being a partaker in the lives of children diagnosed with autism as an early interventionist, as well as a parent of a child with autism. As a parent and professional, I remember coming to North Carolina with the hopes that the early intervention program would have the same learning approach as the one in New York City. To my surprise, the NC Infant-Toddler Program operates on an altogether different philosophy than the one I was used to. At first, I resisted the program’s coaching approach and expected the therapists assigned to my daughter to teach her through clinical and skill-based teaching. I had an excellent service coordinator who helped me learn the richness of being my daughter’s best teacher. I became a believer, and I witnessed my daughter making more progress when I could incorporate the strategies into our daily lives. My experiences as a parent and as an early intervention professional allow me to share the following information about children on the autism spectrum. 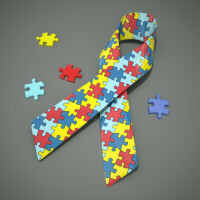 Children on the autistic spectrum have different characteristics, uniqueness, and learning styles. But this is also true for children who are typically developing. The fascinating factor of working with children diagnosed with autism is that they feel and perceive the world through their own individuality. Tapping into that specific uniqueness opens the door to building a relationship, which in turn is an opportunity for an early interventionist or parent to experience the world through the perspective of the child with autism. This approach allows the child to see that her world also has aspects of enjoyment that they can both share. “What in the world is she talking about?” is a question that it is probably visiting the minds of many, but to be specific, this might shed some light. Children diagnosed with autism are believed to be “in their own little world,” where they spend most of their time, limiting the time that they engage in social interactions with others, including their caregivers. Whatever is happening in their own personal space is sometimes more enjoyable and rewarding to them than establishing eye contact with the speaker or stopping to listen when we are trying to redirect them to something else. So how do we tap into their world? By joining them where they are, finding the one thing or things that result in a smile, a laugh, or an “I see you” expression and repeating it over and over, maximizing that shared time that is so enjoyable for the child. In another words, if the child is engaged in a repetitive behavior, such as clapping, clap with him until he realizes that you are also part of that which makes him happy. Imitating embodies the foundations of communication development. When one imitates actions or sounds that children make, it is with the hope that they will imitate in return. Every time a child imitates you, build on it by introducing new and different sounds and movements until the child learns other ways to understand our world. This is an example of a learning approach called “The Developmental, Individual Difference, Relationship-based (DIR®) Model,” created by Stanley Greenspan. The objectives are to build healthy foundations for social, emotional, and intellectual capacities, rather than focusing on academic skills and isolated behaviors. These techniques can easily be incorporated into existing family routines and activity settings, for example, by following the child’s lead during play time or bathroom routines. If the child is interested in playing with cars, read his cues and become a character, rather than a narrator. After doing the same thing next to him and entering into his world, entice him into an interaction. The key is to expand into the child’s abilities. Use gestures, facial expressions, sounds affects, vocalization, etc. to create a continuous flow of back & forth communication. This model is not only effective for children with autism, but also for other children who have other developmental delays or disabilities. Fifteen years of working in the field of children’s development have made me realize that we are forever evolving and learning new strategies, techniques, and learning approaches that equip us with the potential to impact children’s lives and those of their families. The ultimate goal is to share your gift with others and plant a seed of happiness into the lives of those children who are challenged to engage in our world. How amazing will it be if we are the ones welcomed to their world, and not the other way around? Thanks Melida! All too often we get caught up on our own agenda of what we want to teach the child. It’s so much more relaxed and FUN when we join in what delights the child! The reward is a connection that becomes a bond that creates trust. When the child trusts you, you can begin to ask for more. Thanks for this great reminder! Your little girl is sooo lucky to have you in her world! 🙂 and thank you very much for writting this as it is an excellent reminder as we are supporting parents with teaching, engaging with, and enjoying their children. Thank you for sharing your story, Melida. Your blog was wonderful! Melida thank for sharign your story!!! I really enjoyed reading it. Thanks you. What a touching, well written article. Thank you for those wonderfull comments!!! Thanks for sharing…glad to know we are not alone!